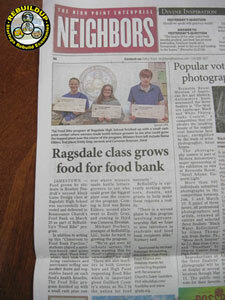 Read about Ragsdale High School’s 2016-2017 Classroom to Food Pantry Pipeline (CFPP) benefiting Parkwood Baptist Church’s Hand to Hand Food Pantry. Click Here for article. Columnist Joel Landau of YES! Weekly was kind enough to do a full page article on our Classroom to Food Pantry Pipeline (CFPP) along with future food related plans. The Classroom to Food Pantry Pipeline (CFPP) for Spring 2016 at Ragsdale High School was profiled on CharacterMattersNC.org which is a joint project between WRAL 50 and NCDPI highlighting student service learning efforts. Click image to view the site. 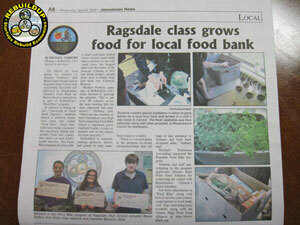 ReBuildUp’s Food Bike program at Ragsdale High School including contest winners and Renaissance Church’s Food Bank were showcased in the Wednesday, April 6th, 2016 edition of the Jamestown News. The High Point Enterprise also put the spotlight on our Food Bike program at Ragsdale High in their Wednesday, April 6th, 2016 paper. 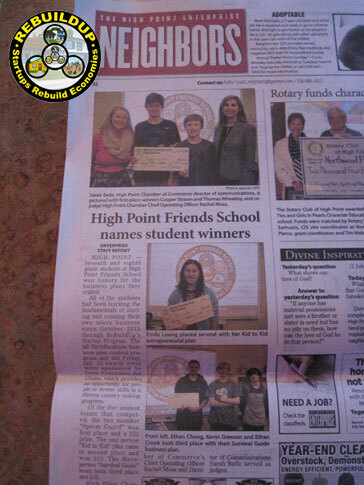 The first place winner of December 2015’s PitchPocalypse business plan contest for Ragsdale High School’s Fall 2015 ReBuildUp Startup Program was profiled in the January, 20th, 2016 Jamestown News. Click here or the image to read the full article. The High Point Enterprise on Friday, January 22nd, 2016 profiled the top three out of five teams that competed in the PitchPocalypse business plan contest to finish up ReBuildUp’s Startup Program at High Point Friends School.